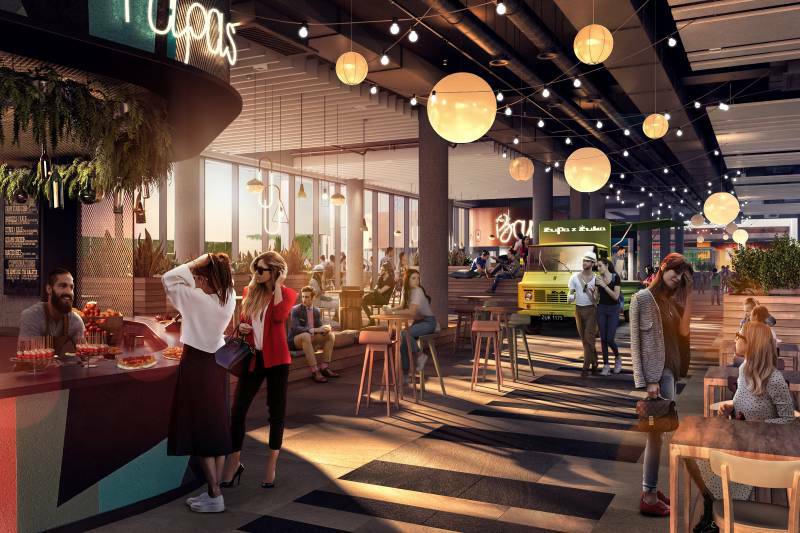 A bakery and coffee shop of the well-known French bakery and coffee shop Vincent as well as a wine bar Boutique Koneser will appear on the list of tenants of Galeria Młociny being developed between the North Bridge Route and Zgrupowania AK "Kampinos" street. Currently, last finishing works are being carried out in the complex. The opening of the projct co-financed by EPP and Echo Investment is planned in the spring. Vincent’s venues are one of the best bakeries, patisseries and cafes in Warsaw. Elegant and full of the unique atmosphere of French boulangeries places are known for the highest quality bread, for which bakers use imported flour from France and their own sourdough produced according to French recipes and other only natural ingredients associated with French patisseries. Vincent, that opened its first premise 11 years ago at Krakowskie Przedmiescie, is credited with launching the fashion for well quality, original breads in the capital city. To this day, the specialty of the chain, which consists of 16 locations - twelve in Warsaw, three in Wroclaw and one in Konstancin-Jeziorna - are baguettes and breads baked in accordance with traditional French recipes. At Galeria Młociny, Vincent will occupy nearly 40 sqm and will be situated on the lowest level of the complex. “Fans of French flavours will have reasons to be satisfied. Well-known and well-liked Vincent will be a tasty break while doing shopping. This spot, which can recreate the unpretentious atmosphere of French bakeries and cafes, will offer you not only fresh and crunchy bread, but also breakfast and freshly roasted coffee, and in the afternoon you can try a cheeseboard. Vincent which is opened in the morning will certainly attract people working in the office part of Galeria Młociny” says Marcin Kopczyk, Senior Leasing Manager at Shopping Centres Department at Echo Investment. Behind this café-bakery success are also brioches, pain au chocolat, croissants and other sweet pastries. Vincent is also a place where you can drop by for a quick lunch or buy tasty, handmade sandwiches. “The wine market in Poland is growing, and clients are more and more willingly to reach for bottles from higher shelves. Boutique Konesera will be a place where we will not only buy excellent wines from all over the world, but also you can learn something new about this noble drink, because the experienced staff will come to help you, for them wine is not only a job, but also a hobby” emphasises Marcin Kopczyk. Boutique Koneser will be situated on the lowest floor of Galeria Młociny. The creator and owner of this 54 sqm store is Piotr Klimczyk, who is well-known because of his passion for wine culture After 30 years spent in France he decided to run a business on the Vistula River. Boutique Konesera is another venture of Klimczyk, after a store Vines de France known among Varsovians. The latest location in Galeria Młociny will offer over 1000 labels. In addition to wines, cognacs, champagnes and armagnacs - also from niche vineyards and distilleries - you can also buy whiskeys and bourbons from different parts of the world. On the shelves you will also find - glasses, openers, wooden boxes and gift sets. A really tasty complement to Boutique Koneser’s alcohol offer will be French sweets and cheeses. “We are open to wine lovers from the north of Warsaw. We would like to be a spot where you can not only get your favourite wine, but you can also talk about wine, learn something new. We will take care of the selection of labels, also from niche vineyards, we will systematically expand our wine cellar. What is more, we will offer professional assistance” says Piotr Klimczyk, the owner of Boutique Koneser. Boutique Konesera will also be a meeting place, workshops and tastings. The owners highlight that they care about to be open for everyone who want to learn how to taste and choose wines to dishes, as well as distinguish wines from different strains and parts of the world. “Galeria Młociny is a unique location on the map of northern Warsaw. We are happy to join the group of its tenants where residents of Warsaw and the surrounding area will not only be able to buy high quality products, but also have a delicious meal or talk about their favourite drinks” says Rafał Lisak, Director of Galeria Młociny from EPP, that ultimately will manage the complex.